For over fifteen years we have been specialising in hard landscaping and renovating gardens across Surrey, Hampshire & Berkshire. Our highly experienced team builds beautiful gardens, Patios, Cobble driveways, Block paving driveways and water features all to the highest professional standards. We are an experienced company specialising in Hard Landscaping, Patios, Block paving driveways, garden brickwork, sleeper walls, dry Stone walling, pergolas, sheds and other features to enhance your garden. We can help you choose from the wide range of patio designs and styles and also help you choose what type of paving slabs, or Block paving and if you require a central design. We can help with your driveway design and recommend the best solution for you, Block Paving, Concrete or Tarmac. Additional services include planting, fencing, decking, pond construction and maintenance and groundwork. We predominantly operate mainly in the Farnham, Godalming and Haslemere areas and have customers in other locations including Guildford, Fleet, Reading, Fareham, Newbury and Woking. 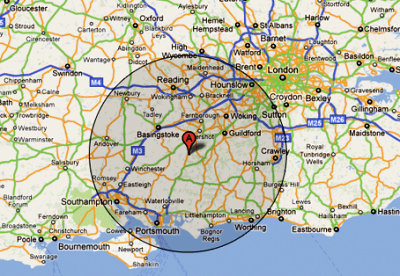 For larger projects we are willing to travel a 1 hour radius from GU35 as shown on the map below. please call us for further details.